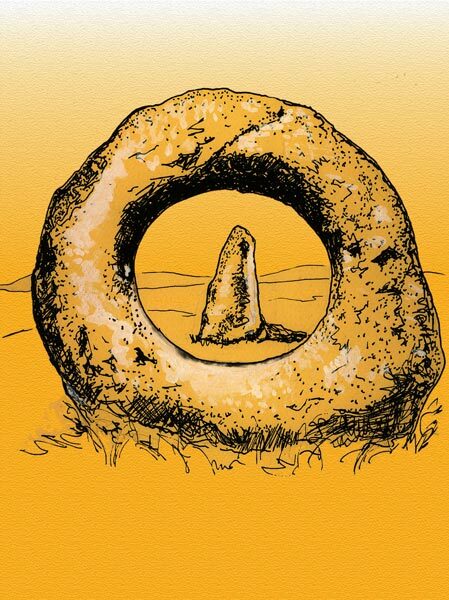 The Men-an-tol stone found in Cornwall, England is just one of more than 900 stone circles and groupings in the British Isles. What prompted our forebears to work so hard to mark the earth in this way? This stone looks like a four foot high wheel. The triangular menhirs, standing stones, on either side are about eight feet high. In Welsch, men means stone, and hir means long. Think about stones and what they may be speaking to your group. This particular Cornish stone may have at one time been a part of a larger stone circle. What happens in stone circles? Why, like the tall circle at Stonehenge and the complex patterns at Avebury, did the Ancients in Britain place them just so? And what group ritual and astrological events may have taken place there? How might ritual enhance your community’s wisdom gathering? What might pass through the opening, and change? Yellow: yellow invites us to seek new experiences and challenges. It’s an optimistic, hopeful, healing and self-empowering color.